With cooler weather comes LOTS of hot drinks. They are the only way to relieve the chill in your bones. 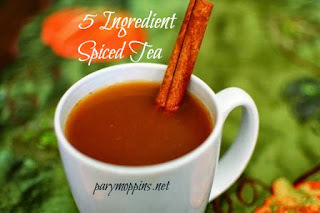 Spiced tea is one of those recipes that you see everywhere during the Fall. My Momma makes her recipe every year and used to send it to me in care packages while I was away at college. Thanks Momma! I've been known to make my mix with all manner of spices - allspice, cloves, coriander, cinnamon, nutmeg, cardamom, and any other spice I thought might be interesting, but that gets expensive and not everyone likes cardamom in their spiced tea. Just sayin'. As with most recipes, I got to fiddlin' with Momma's spiced tea recipe. This is the easiest and quickest way I know of to make this mix. It only has 5 ingredients. The pumpkin pie spice is a frugal alternative to buying a bunch of separate spices. Put all ingredients in a quart mason jar. Screw the lid on the jar and give the contents a good shaking. To use, put 2 tablespoons of the mixture in a mug and pour over boiling water. A little note: This is one of my favorite drinks (along with hot Jell-O) when I am ill. I'll put powdered Vitamin C and powdered magnesium in the mug with my mix. Also, this recipe is a great jumping off point. If you find you like your tea sweeter, add sugar or your choice of granulated sweetener. 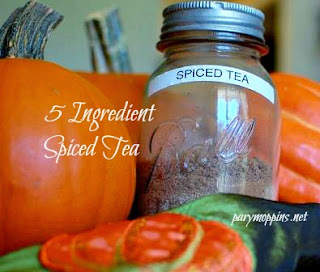 Spicier, add more pumpkin pie spice or one of the above listed spices. More tea or citrus flavor, add tea or powdered citrus drinks. This is totally customizable. This is part of Full Plate Thursday and See Ya in the Gumbo. This sounds delicious and it would make a great homemade Christmas gift! Great idea! I was thinking the same thing, great Christmas gift! Maybe if you put a cute label on a jar and give this mix with a couple of mugs that would make a great Teacher's Christmas gift. I love spiced tea! :) This reminds me of my grandmother's delicious homemade orange spice tea. Definitely pinning! I've enjoyed reading your posts, We like the site and will be back Great blog you guys have, some very good news and important information. We love your site. I just love this tea and was thinking about making some the other day. Thank you so much for taking the time during this busy season to share your wonderful post with Full Plate Thursday. Have a wonderful weekend and hope to see you again real soon! Sounds perfect for a chilly autumn afternoon. I can see how this would be nice to have when feeling under the weather. I think the aroma alone would perk me up. I also didn't know that Tang was still around! Thank you for stopping in and sharing your tea! You're right, the aroma is wonderful and definitely helps warm you up when it's chilly outside.